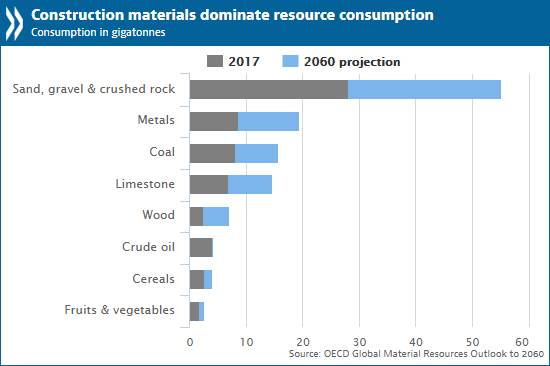 A preview of The Global Material Resource Outlook to 2060 released today by the OECD sees global raw materials use rising to 167 Gigatonnes in 2060 from 90 Gigatonnes today as the world population soars from the 2011 total of 7 billion to 10 billion people by 2060 and average global income per capita rises to converge with the current OECD level of USD 40,000. 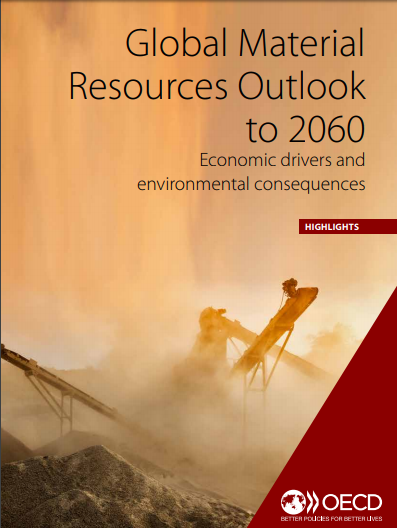 The OECD is warning that without concrete actions to address these challenges, the projected increase in the extraction and processing of raw materials such as biomass, fossil fuels, metals and non-metallic minerals is likely to worsen pollution of air, water and soils, and contribute significantly to climate change. The increase comes despite a shift from manufacturing to service industries and continual improvements in manufacturing efficiency, which has lessened the amount of resources consumed for each unit of GDP. Without this, environmental pressures would be worse. The projection also takes account of flattening demand in China and other emerging economies as their infrastructure booms end. The preview report, presented at the World Circular Economy Forum in Yokohama, Japan by OECD Deputy Secretary General Masamichi Kono, says the biggest rises in resource consumption will be in minerals, including construction materials and metals, particularly in fast-growing developing economies. By 2060 non-metallic minerals, such as sand, gravel, limestone and crushed rock will account for more than half of total materials consumed today in Gigatonne terms. Adding other materials, the total raw materials consumed by an average family in a day would fill up a bathtub. These volumes will only become larger between now and 2060, the report warns. While the recycling industry, currently a tenth the size of the mining sector in terms of GDP share, is likely to become more competitive and grow, it will remain a much smaller industry than mining primary materials. Within this group of metals and minerals, copper and nickel tend to have the greatest per-kilo environmental impacts, while iron, steel and concrete have the highest absolute impacts due to the large volumes used. The extraction and burning of fossil fuels and the production of iron, steel and building materials are already major contributors to air pollution and greenhouse gas emissions. In the absence of new emissions-cutting policies, the report says overall emissions from rawvmaterials management will grow from 28 to 50 Gigatonnes of CO2-equivalent by 2060.